In 1963 I received a letter from a young man from Alsea, Oregon. At that time I had a weekly television program in Portland and was receiving many letters from different talents in the Northwest wanting to be a guest on my program. This young man’s letter was one of these, but this letter was written with such honesty and personal sincerity that after reading it I felt as if I already knew the man. His name was Buzz Martin. He said that he had worked in the woods all of his life and that he wrote and sung songs about the experiences, and the people of the woods. He also added that he had never been on a television program before. I made an appointment with this young man and it wasn’t long before I had him on my program. Shortly after that I helped him cut his first record, and soon became one of his biggest fans. Today I consider Buzz one of my best friends. I have watched his career closer than most anyone because this man is the kind of man you grow to love like men can love men. Because of this I’ve been close to him through his good times and his bad times, and I would like to say that no matter how empty or full his pocket is, his sense of humor always overflows. Being a musician for 28 years I’ve seen the work of thousands of undiscovered or semiprofessional writers wanting an opinion of their work. After all the work I have looked at I sincerely believe that Buzz is the greatest writing talent in the Northwest. My band, “The Simmons Family”, which includes my two sons Don and Larry, has been on stage with Buzz at personal appearances several times, a person can feel the common bond and respect between he and each member of the audience. It makes little difference if you’ve worked in the woods or not, you’ll understand. This is the fourth album for Buzz Martin. Its title, ”The Logger – A Vanishing Breed Of Man”, I don’t care for. 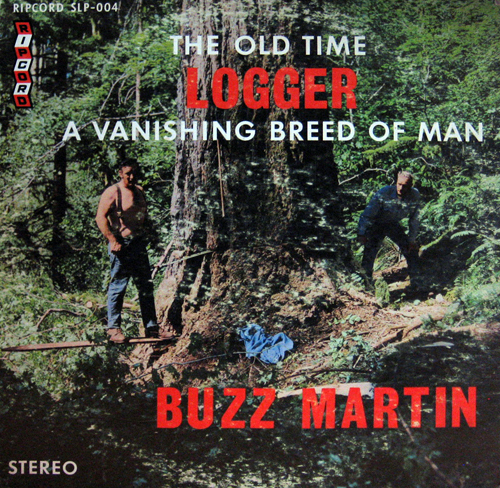 I hope there will always be a Buzz Martin and that special breed of man, called the logger. If this is the first time for you to meet Buzz Martin, listen closely to the words. That’s the great thing about all Buzz Martin songs, the words. Some of the words only loggers understand, but you will enjoy each song, even if you are not a logger. I know I do. 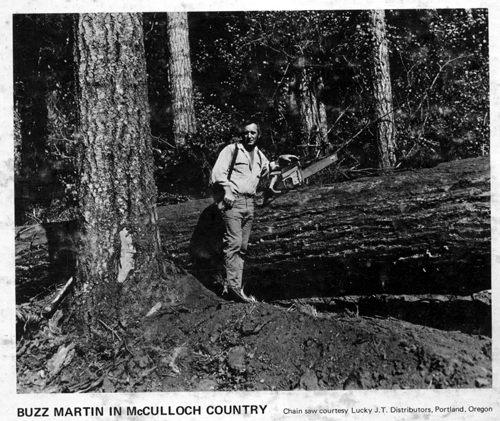 And all I’ve ever known is Radio Stations, Guitars, Bandstands and a lot of nice people, and about the nicest is a man I call “Oregon’s Singing Logger”, Buzz Martin. Is this the same Buddy Simmons that used to have his band playing at the dance hall – Watkins Park, and all the other east side Portland favorite spots? A lot of us talk about you and wonder about your whereabouts. If you are Buddy Simmons please send a quick e-mail. Loving Memories! !